This specific Elf Dunya who represents the BLUE color of the Rainbow with her Beautiful Blue hair. Dunya loves water. Every now and then, she sets sail in her self-made boat and afterwards tells her friends about her adventures. Dunya invents things all the elves get excited about. Dunya - All of the Rainbow Elves are fond of Dunya because she gladly helps others and always has great ideas. Her ideas are not only great; she sometimes even invents entirely new things, for instance she once made an amazing cradle. Dunya loves to tell funny stories and she likes water. She can sit at the river for hours and behold the water passing by. Sometimes she sets sail in her self-made boat, but only takes her boat out as far as she can still see the shore. Dunya Elf comes holding a beautiful flower that can be removed and played with separately. Dunya measures approximately 3.5 inches tall. Meena flower measures approximately 1 inch tall. 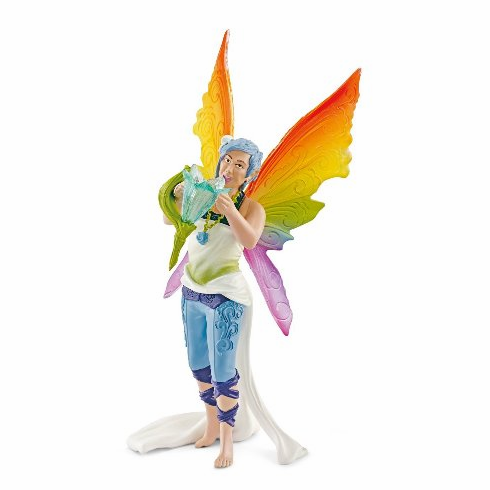 Meena beautiful rainbow wings measure approximately 3 inches tall. Technically, there was a production error and no RED hair elf was released - Schleich uses the Rainbow Dragon (all colors) to fill in for the Red Elf.